We’re probably a month or at most two away from the big unveiling of HTC’s new flagship phone, also known as HTC M8. I’m pretty sure the codename won’t stick, since the HTC One was the M7 before it. Today we catch a glimpse of the newcomer as imagined by Ancel Lim. He gathered all the info he had from various leaks and created this render you see here. The second generation HTC one comes with a Qualcomm Snapdragon 805 new generation processor, a quad core 2.2 GHz Krait 400 CPU, as well as a Full HD 5 inch screen with Gorilla Glass 2 protection. We’ve also got a microSD card slot inside, 4G LTE connectivity and NFC. 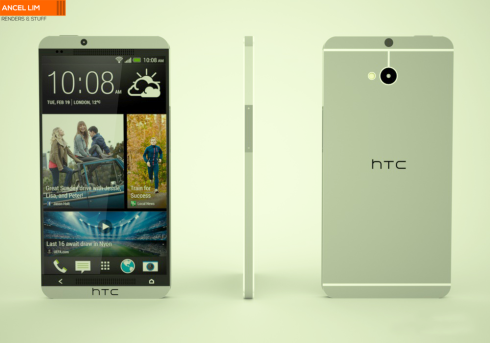 There will be a dual SIM version of HTC M8, without 4G and Snapdragon 800, but rather with a quad core 1.7 GHz Krait 300 CPU. Keep in mind that Beats Audio is gone here, but we do have BoomSound speakers at the front. The novelty here compared to the predecessor is that the handset is thinner, flatter, more rectangular and it has smaller bezels.